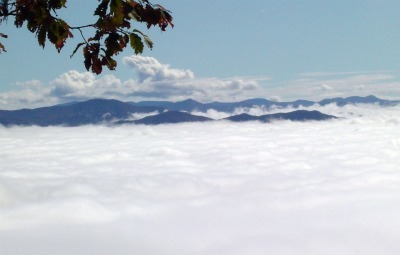 Noland Divide, A Must-Hike in Deep Creek! Noland Divide is my favorite hike in the Deep Creek area and one of my favorite hikes overall in the Smokies. The reason? The outstanding views! I've hiked the entire length and it's a wonderful 11.6 miles of trail. If you want to hike the whole thing, I recommend starting at the Clingmans Dome Rd. trailhead. That way you'll be hiking downhill. 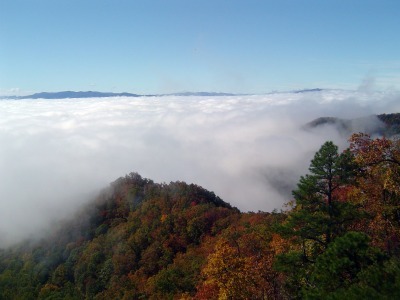 You could also start at Deep Creek Campground and hike 3.5 miles to Lonesome Pine Overlook. It's the best part of the trail. Then you could just return back the same way. Spring and fall are both great times to hike it. If you plan on starting from the Deep Creek Campground, the trailhead is at the horse parking area, before you get to the pavilion on your left. Although the 3.5 miles to Lonesome Pine Overlook is an uphill climb all the way, it's not overly steep. 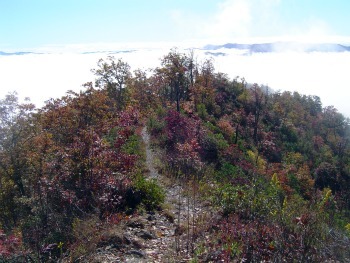 The trail will open up a bit before you get to Lonesome Pine Overlook. You'll know it when you get there, because the views open up on both sides and there's a large rock just perfect for taking in the views. The time I went in the fall, the colors of the mountain view was incredible. What was really cool was the clouds were so thick they looked liked cool whip. Approximate Elevation: Elevation at Deep Creek Campground is 1800'. Lonesome Pine Overlook is at 4100'. Clingmans Dome Road is at 5900'. How to get to the trail: To get to Deep Creek Campground trailhead, start from Bryson City, NC and follow brown signs leading to campground. To get to the Clingmans Dome trailhead, turn onto Clingmans Dome Rd. from Newfound Gap Rd. Drive for 5.5 miles and trail will be on the left.